According to the American Sleep Association, approximately 10 percent of Americans suffer from bruxism, a common sleep disorder that causes the person affected to unintentionally clench the jaw and grind the teeth during sleep. At Joe Isaacson Dental in Oklahoma City, OK, Dr. Isaacson and his team help people with bruxism avoid the many consequences of this subconscious behavior with general dentistry services and customized oral appliances called nightguards. How Does Bruxism Affect Me? Because bruxism can cause serious damage to your dentition and lead to chronic pain that interferes with your daily life, it is important that you speak to Dr. Isaacson as soon as you notice any signs of the disorder. He may suggest that you use a flexible, comfortable oral appliance that is customized to fit the contours of your mouth. The nightguard is worn while you sleep to prevent the clenching and grinding actions that cause these problems. If you’ve noticed any of the tell-tale signs of bruxism in your own mouth or in anyone in your family, contact our office in Oklahoma City, OK today to schedule a consultation with Dr. Isaacson. 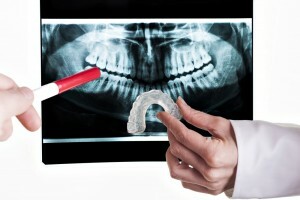 The doctor and his team look forward to helping you conquer your teeth grinding dilemma with a custom-fitted nightguard. We also happily welcome families from nearby communities in Mustang, Yukon, Edmond, Piedmont, and beyond.